This week I flew to Sweden for a one-day meeting. That humanity even has the ability to do that is a miracle and something to be grateful for. But that’s not the point of this post. My flight left Boston shortly after 7 pm Tuesday evening, and a short five-and-a-half hours later, I was changing planes at Heathrow. Although it was morning in London, my body clock was protesting that it was still the middle of the night, albeit confused seeing the sun. 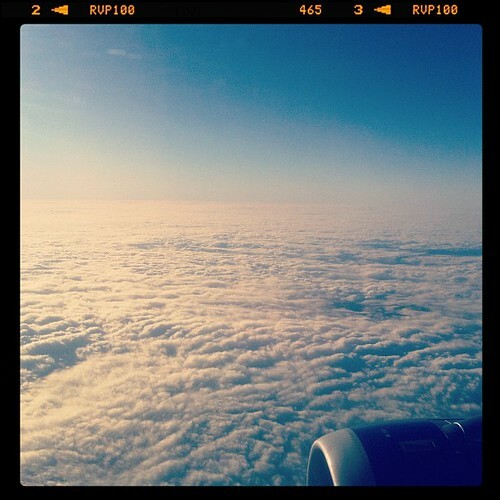 This photo was taken somewhere over England, on the flight from London to Gothenburg. The combination of morning sun and the usual cloud cover made for a spectacular view. The warmth of the sun’s rays streaming through the window even made up for the short night. And did I say that it’s a miracle we can do this? I find the view from 35,000 feet gives a unifying perspective. Yet, to your point, we miss the local flavor, the diversity that makes life so interesting. I love the photo. And the sentiment. Sometimes I marvel at how quickly we can zip across the planet. Sometimes I think it is kind of a shame. I wonder what we are missing in between.